Summer meals, whether you are cooking them out on the grill, in the kitchen or not cooking at all and trying to keep things cool and light, call for some easy side dishes that taste great. Sure coleslaw and potato salad are always great standbys, but I have found myself recently trying to make more use of different beans in my main dishes and side dishes. Beans are a great source of fiber and protein and can go really well with a lot of the summer vegetables and fruit that you find available right now. 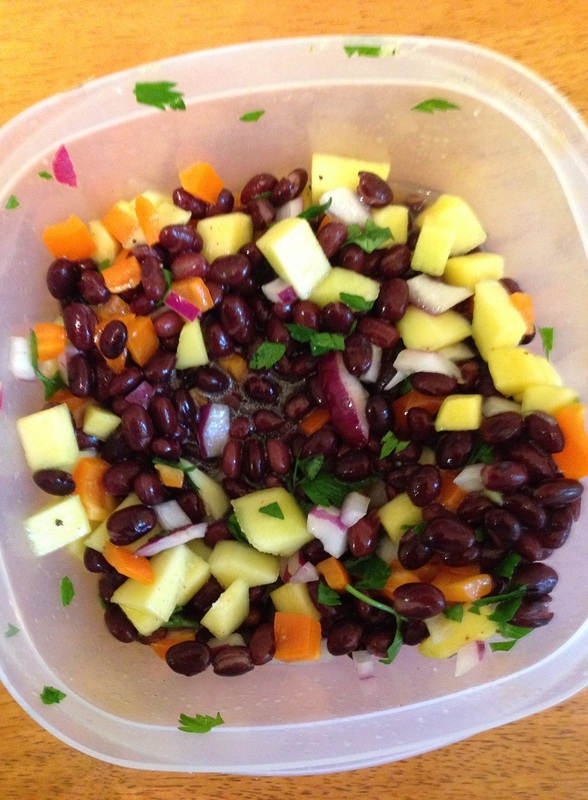 I came across this really easy recipe from the Cooking Channel for a black bean salad with mango, cilantro and lime and it sounded so easy and refreshing that I just knew I had to give it a try one night. In a small mixing bowl, combine the apple cider vinegar, the lime juice, the honey and the ground cumin. Slowly whisk in the canola or vegetable oil until it is well incorporated. Season with salt and pepper to taste. Mix the diced mango, diced bell pepper, black beans, minced jalapeno pepper and the diced red onion together in a large bowl. Drizzle the vinaigrette over the ingredients and toss everything together until it is combined. Season the salad with salt and pepper to taste. Garnish the dish with the cilantro and serve. I loved he freshness of this salad with the vinaigrette. The lime juice really made it all pop together, but to me the mixof the black beans, jalapeno, red onion and the mango are what really make this work. You get such a great medley of flavors with the freshness of the mango combined with the bite of the onion and the jalapeno that it all seems to go really well together. This salad works well as a side dish to just about any type of chicken, pork or beef dish and could even stand on its own as a vegetarian meal if you wanted it to. I served it as a side to some pulled pork tacos I made (which I ill be posting the recipe for tomorrow) and it was fantastic on the side or right on the tacos themselves. I think it would also work great with quesadillas or burritos.